In my travels, I frequently meet young people who are interested in becoming EMS helicopter pilots. While many of us flying HEMS today received our training and built our experience in the military, in the future that will not be the path for many. Hello, how are you doing? been a while since we chatted. A friend of mine recently had a friend of his contact me wanting information about becoming a Rotary Wing aviator via the civilian route. He is former Navy and plans on using the GI bill for flight training. You are in a much better position to advise him as to the job market etc. Would you mind if I gave him your email and let him contact you? In the Army, flying a helicopter is a third-tier duty. First you are a soldier, then an officer, and when these responsibilities are complete, then -maybe -you fly. Indeed, flying is but a small part of a military pilot's responsibilities, and not everyone is interested in the additional duties. Whereas the military used to be a good way to a great retirement and lifetime healthcare, those days are over - military members are faced with cutbacks at every turn. I had the pleasure recently of meeting a fine example of the future of helicopter aviation, HEMS in particular. 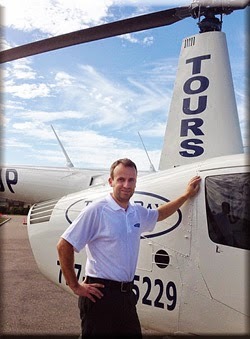 Zack Taylor is a line-pilot flying AStar helicopters all over Georgia and Florida, he is also the owner of a helicopter-business in Clearwater, Florida, and between his two obligations he is a busy young man. The business Zack owns does tours, and for-hire utility work, but his main focus is on flight training. And he does it well. Zack Taylor has been a Certified Flight Instructor (CFI, CFII) in helicopters since 2008. 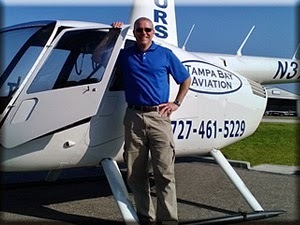 Zack is also a Designated Pilot Examiner with the Tampa FSDO and provides in-house check rides for our helicopter students. 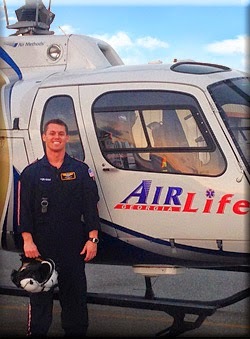 When Zack is not at the flight school, he is usually flying Eurocopters for AirLife in Florida and Georgia. 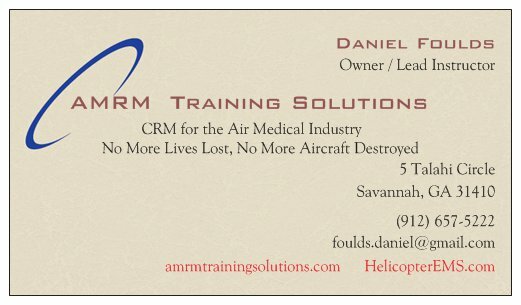 Prior to flying EMS Zack flew Bell Helicopters in the Gulf of Mexico to the oil platforms and also has experience flying tours as well as years of flight instruction experience in the Tampa Bay area. His turbine helicopter and “real world” experience along with his teaching background make him a well-rounded instructor. The fact that Zack is a designated pilot examiner is no small detail. This means he can both train and certify pilots to earn a living flying. Of course he has a full staff of instructors, and 12 aircraft (both fixed and rotor) under his control - but it is his connections that are key. SideBar: Zack has almost completed the requirements to operate as a CFR (Code of Federal Regulations) Part 141 school. This would allow GI Bill recipients to use their benefit for flight training. Stay tuned... From our time together on the HEMS line, I have picked up that Zack is going to do well for himself - but more importantly it occurred to me recently that he is in a favored position to help lots of other people who want to fly helicopters do well for themselves too. 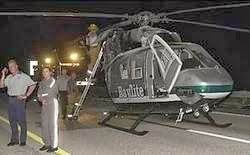 Say you want to become an EMS helicopter pilot without spending six or a dozen years in the military. You now have a clear path with connections from start to finish. 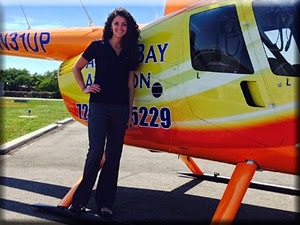 At Tampa Bay Aviation you can progress from your first-ever helicopter flight to a commercial-flight-instructor qualification with 200 hours of experience. As an instructor you teach the next wannabe, (aviation is a pyramid scheme) and add time to your logbook on his or her dime. You won't make much money instructing, and will probably sleep in a crash-pad and eat Ramen Noodles, (like many airline pilots flying the line today) but you will quickly progress towards an experience level that will allow you to earn a real paycheck. A good and logical next step for an aspiring HEMS pilot would be to fly tours for one of the two tour companies owned by the largest air-medical helicopter company in the world. Air Methods Corporation recently bought Sundance Helicopters in Las Vegas and Blue Hawaiian Helicopters in Hawaii, in part to create a pipeline for EMS pilots who can finish building their flight experience by flying tours. Tour pilots fly long hours each day, and build time more quickly than perhaps any other sector of the helicopter business. The one piece missing from Air Method's recent vertical-integration move is the initial leap from earthling to aviator. But Zack Taylor can do this - and he works for Air Methods...In discussion Zack told me about how he bought the company he and his wife own today. He was an employee, and then the prior owner offered a deal Zack couldn't refuse. He jumped in and hit the ground running, and has grown his business since beginning. In fact he is so busy that he is trying to work out a way to serve two masters at once - here's hoping he succeeds. Two hundred hours and an instructor qualification will run you around $65,000 - or around $60,000 if you pay up front for the entire qualification. This sounds like a lot - but if you dig into what it costs to operate a helicopter it will make more sense. The cost is a barrier to entry into the profession, and is one reason why a new EMS pilot earns about 4 times what a new airline pilot does... Student loan programs are available. How Did You Get Your Job In HEMS? The FAA has delayed for a year the implementation of much of its revision of rules governing helicopter operations to allow operators, and itself, time to adopt the many changes. The final rule was published Feb. 21 and was to take effect on Tuesday but it was apparently too soon for all involved. "Since the publication of the rule, it has become evident that this effective date does not allow certificate holders sufficient time to complete all the necessary steps to implement the new rule," the postponement rule says. However, a little further down, the FAA admits it isn't ready either. "In addition, the FAA has determined that the April 22, 2014 effective date does not provide sufficient time for the FAA or the regulated community to implement the other operational rules which are currently scheduled to take effect on that date," the new rule says. Some of the rules were already delayed and they won't be delayed any further. The FAA says it will have the time to get ready for them so the operators will be expected to, also. Most of those cover the most expensive compliance measures, including the installation of avionics, emergency equipment and the creation of operations control centers, all of which will have to be in place between over the next four years. There are lies, damn lies, and statistics. Perhaps it is time for some pushback from FARE, the Foundation for Aeromedical Research. One thing ignored by this type of report is the use of helicopter transport prophylactically, or "just in case." This is the rationale given for a significant percentage of healthcare services, like CTs and diagnostic tests. If you argued that the available helicopter "probably" isn't needed and that the patient will "probably" be okay without it, I would say - if it was my loved one - lets fly. The report also ignores the fact that the vast majority of ground ambulances are not staffed with a critical care nurse - and occasionally they are vital. Catching a hidden error, before it counts. Sitting in a recliner at 3:00 am recently, listening to radio traffic from several helicopters on transports, I heard one fellow call-off from his base, obtain coordinates for a scene, and then, after arriving at his destination, call to say no one was there. He asked the communications specialist to check on the coordinates for accuracy and was told to stand-by. After a few seconds of silence, he came back on the radio and said, "disregard, we have the correct numbers now and are proceeding to the scene - we are about 3 minutes out." He had incorrectly entered the numbers that his crew copied and read to him. I have done the same thing. You get in a hurry entering data, and you punch the wrong button or roll the wrong number. This type of mistake led to the Russians shooting down a KAL jet. Fatigue contributes to these types of errors. To read about the KAL shoot-down, click here. Because we fly HEMS, we frequently check our info and dart out the door. Occasionally we head to the wrong place. Once a pilot arrived at Ridgeland (SC), when he was supposed to be going to Richland. Ridgeland is a town near Beaufort, and Richland is a hospital in Columbia. I was given the heading and distance to Estill recently, when I was supposed to be going to Edisto - the similar sounding name confused my comspec - and me. The paramedic caught the mistake by looking out the window. Spoken communication is an imperfect process. Not long ago I was pushing toward the end of a 16 hour day, and although I said I felt fine subjectively, the truth is I was fatigued. Objectively, my performance was degraded. Fatigue has both subjective and objective components. How we feel versus how we perform. I wanted to get it over with as soon as possible. (Get-home-itis) As I loaded my destination into my GPS I entered a couple of characters, the box finished filling the field, I saw the name of my destination-town in the display and pressed direct-to. I made my error at the beginning of my flight, and it didn't show up till near the end. Just like that KAL jet. I had all the time in the world to discover it. If one person is doing it, other people are doing it too.So what can we do about this early-mistake problem? How about, after darting out to the aircraft, and once established in cruise flight, we do a "DART" check. Destination - lets all agree that where we think we are going is where we are supposed to be going. Check the heading and distance in the GPS against what was originally transmitted and also against what we are all familiar with - medics who work the ground before flying are a great resource regarding what is where. Restate the name of the destination, be it a city/town or a hospital in a city/town. Altitude - is the altitude we are at appropriate for the patient, terrain, weather, and winds aloft? And what about that highest-obstacle we checked before leaving? When a helicopter lost it's engine due to ice ingestion while cruising at 500 feet above the ground, it had about 10 seconds until touchdown. The recent tour helicopter ditching in NYC occurred in a similarly short period of time. Altitude equals time to think, talk, recover rotor rpm, and make it to a suitable landing spot. And what about the bird threat? According to research, 90% of all bird strikes happen below three thousand feet AGL. Birds like marshes, lakes, rivers, game preserves, and trash dumps. If we are going to cross one of these areas, are we doing everything we can to avoid birds? Route - Once things settle down enroute, lets take another look at the map and make sure that the route of flight isn't going to penetrate any special-use airspace or airport traffic area we didn't think about. This is also a good time to talk about any nuke plants in the area. We may be questioned if we fly near one. Time - Is the time required, now that we are in the wind, still going to work with the fuel on board? Do we still have enough drugs and O2? Most of us already do some sort of level-off or cruise-check, Adding these other checks to the routine, using this mnemonic as part of your level-off or cruise check may prevent disappointment or disaster. We hope you enjoy safe flights. 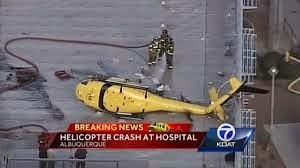 Do you remember the crash of a helo related to ice ingestion. One guy lived. He needs help now, and is going to need help in the future. He is one of us, and any one of us could be him. I think he should get thousands of messages of support from us, people who fly HEMS. And some money wouldn't hurt either. A huge hug to "The Chive" for putting together a rescue mission for Billy's finances. I am now a "Chiver." You guys rock. Post by Healthnet Aeromedical Services Base 7 / KY 9. (4/17/14) As often happens with original information concerning an event like this, the speculation that the aircraft's engine may have been at idle during takeoff appears to be unfounded. One noteworthy comment from the pilot's statement to the NTSB is... "The pilot added that the pedals were jammed or locked, in the neutral position." Pedals can become jammed for various reasons. One way to make the pedals hard to move (but not impossible) is to forget to deactivate the hydraulic accumulator test switch. If this push-button switch is inadvertently left in the depressed position (after checking that we can move the cyclic using the stored pressure in the accumulators - as would be required in the event of loss of the aircraft's single hydraulic system), the pedals are hard to move as the tail rotor load compensator is deactivated during this test. Until the NTSB issues their final report, all forms of speculation are just that. 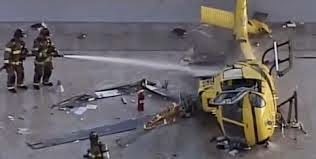 This is the second Astar crash in a short period of time that involved a counterclockwise rotation just after liftoff... the other crash was a news helicopter in Seattle, Washington. The report is available by clicking here. Click here for video of removal from roof top pad. This crew was fortunate to walk away. There isn't one person who posts on this forum who hasn't made a mistake. Little ones are easy to fix. Big ones like these, not so much. This is a perfect example of why we ALL need to remain ever vigilant while performing our duties. We all have our checklists. Make sure you use them! Everytime! Be safe out there friends! I understand Orson Welles ( of "War of the Worlds" radio-drama fame) once said that people write for three reasons. 1. Ego. A need to feel important. 2. Revenge - they have an axe to grind. 3. For posterity. To live on after death. So why me? Ego is in there; sure. I am over the revenge urge. Anyone who has ever slighted me may have had a reason to do so, and did me a favor in the long run. Mostly though, I write about HEMS to try and leave it a little bit better than I found it - like a good pilot who tries to leave the base and the aircraft a little bit better than he or she found it. To be honest, there is another reason I write, and stand in front of rooms full of people to talk about what we do. Today, there is a beautiful young woman working at Memorial Hospital in Savannah, Georgia. She is on the peds/neonate team and flies in the LifeStar helicopter to care for sick babies during transport. 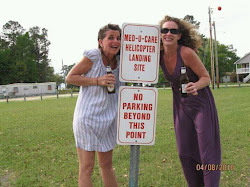 She also happens to be the niece of a friend - who flies on that same helicopter. A decade or so back, I was invited to Jeff Clifton's wedding on Tybee Island. Jeff was at the time my partner every other weekend - sitting next to me in the front seat of a BK-117. We are 10 years apart in age (to the day) and worked well together. Jeanne and I offered to have the reception at our home on Talahi Island and after getting everything set up, we got in our car and headed out highway 80 to the beach for a ceremony on the pier. There is a narrow bridge just past our island, crossing the Bull River. It is old, only two lanes wide, with concrete rails hard up against the edges. It is a long curving affair, and has been the scene of some spectacular crashes. As we crossed the river doing 60 or so, and began the sweeping right turn, I saw the block of wood in the road in front of me. It was a piece of dunnage or shoring, and probably fell off of a flat-bed truck. It looked to be 10 by 10 and about 18 inches long, and lay right where my left front wheel had to go. As luck would have it, there was no one coming from the other direction, so I was able to swerve across the double yellow line and avoid running over it. I remember thinking, "that's gonna hurt somebody, I should stop and pick it up." Then complacency, or laziness, or bystander mentality kicked in and I thought to myself, screw it. It isn't my problem. And we went to the wedding. It was a nice ceremony, and Jeff's cousin Tony Moye showed up. Tony is fun to talk to, and we caught up and had some laughs. His daughter was in school to be a nurse - she wanted to take care of babies - and was headed out to join us. But she was running late... and then his phone rang. She had hit the wood. When she got to it, there were cars on the other side. She couldn't swerve left as I had done. And couldn't stop in time. The wood destroyed her car's front end, and could have killed her. I saw it, and knew what it meant, and did nothing. 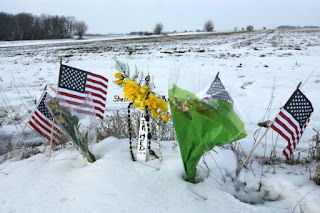 Five years later, I knew about another hazardous situation, involving an EMS helicopter pilot. It wasn't at my base, it wasn't going to hurt me, or my wife, and again I did nothing. And then this pilot flew his nurse and his paramedic into a storm and killed them all. I knew about the pilot's willful behavior. I knew that he was comfortable flying near bad weather, indeed I knew that he sometimes told other pilots to do it too. I should have done something. I should have called him (out). I should have told him an Astar is not a Marine helo, has little power, and is not meant for instrument conditions. I should have told him no job is worth dying for, and flight volume can't be improved by taking chances - not in the long run. I should have pointed out all the others who had made similar mistakes and ended up sorry, or dead. But I did nothing. I didn't even send a warning-shot like Dennis did; an email along the lines of "hey guys we have problem here..."
Dennis was told to mind his own business. But at least he tried. He doesn't have to carry guilt. I won't be driving past any more blocks of wood in the road. And I hope I can leave HEMS a little better than I found it. 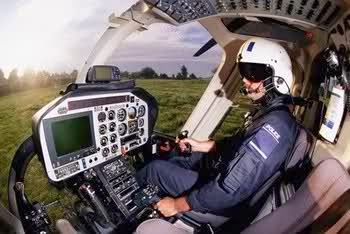 What is it like to fly EMS? But what about us in our single-pilot helicopter? Who is available to monitor us? Well, if you asked the FAA, it wouldn't be the medical crew members on board. 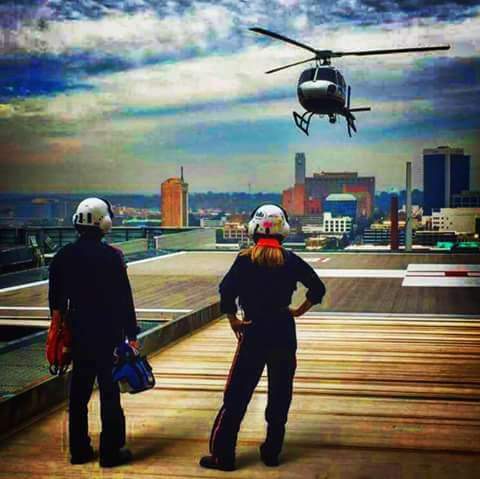 The Feds, in a recent change to rules for HEMS state "... medical personnel cannot be expected to meaningfully participate in the decision-making process to enhance flight safety." Heck they don't even consider medical crewmembers to actually be - well - crewmembers. They are just "passengers." But wait! What about the passenger who sits in an exit row on a commercial passenger jet, and gets briefed on duties and responsibilities associated with sitting there. In short, if the plane crashes that "passenger" is expected to perform certain lifesaving steps to ensure occupants can get off the jet. It's almost as if the FAA, who created this obligation, expects that exit-row passenger to serve, in an emergency, as a "crewmember!" This for a person who might have only flown once. Not hundreds or thousands of times like a medical "passenger." If you read these documents, you can see how words can get taken out of context, which shifts the meaning of what was written. This all relates to the FAA wanting all legs of a HEMS flight to be conducted under more stringent "for hire" rules of CFR part 135.. Fair enough. But to say that the other humans on board, who are smart,and often have years and years of observing how things work - and can be developed as a resource and added layer of safety monitoring, "cannot participate in the decision making process to enhance flight safety" is just plain wrong. The real shame is that some of the Drongos out there, flying HEMS, who want the passengers to strap in and shut up, have taken these out-of-context excerpts as validation for their "lone-ranger" mentality. Here's hoping nobody gets killed over this. Drongos are little birds that fly around and crap on everyone and everything...click here to learn more about the history of using every available resource to greatest benefit. Most pilots who fly HEMS develop their team mates into resources that can be relied upon to help get the job done. The medical crew does the same thing, having pilots help with loading and unloading, using extra hands while transferring patients from sled to bed, and occasionally even squeezing an ambu or IV bag. Being a helper doesn't take much training, and a helper can be invaluable when the workload gets high. If you as a pilot think that the medical crew are nothing more than a distraction - perhaps you aren't managing the relationship "optimally." 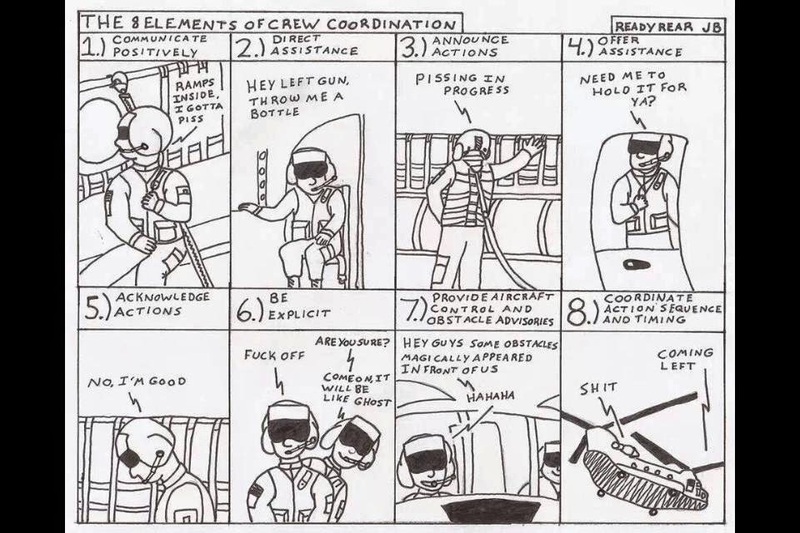 I ask my crewmembers to monitor my performance, as would a second pilot, and to point out anything they think is wrong. In case I somehow missed it. They are the only people in the world who are available to do this. If you aim a laser at a helicopter, you might be headed to jail! Click here. Seems kinda stupid doesn't it? To willfully aim a laser at a helicopter? But we have been getting spotlighted for years, so I guess it's not suprising. We must be ready for whatever whenever and never let our guard down.